This nourishing soup gets most of its flavor from dashi, a light Japanese broth made from seaweed and flaked bonito fish; it's savory without tasting fishy. We like to use a combination of Asian greens, which you can find at most farmers' markets, but tender spinach makes a fine substitute. Kombu (dried sea kelp) and bonito are available at Asian markets and many grocery stores, including Whole Foods. Prep and Cook Time: 1 hour. Notes: Don't be tempted to use ready-made miso soup as the base, as it lacks the subtlety and freshness of homemade dashi. Make dashi: Soak kombu in 8 cups cold water for 20 minutes. Bring to a boil and add bonito. Remove from heat, let sit 5 minutes, then strain through a fine-meshed strainer into a large saucepan. In a small bowl, mix 2 cups hot dashi with miso, stirring until there are no lumps, then stir back into rest of dashi. 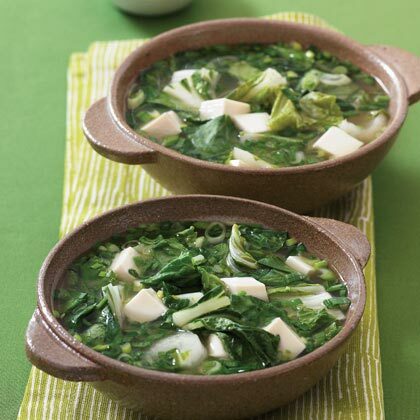 Bring liquid to a gentle simmer (do not boil) and stir in greens, bok choy, scallions, and ginger. Once greens have wilted, stir in tofu and let simmer 5 minutes, then divide among bowls and serve immediately. Serve with chili sauce and/or sesame oil, if you like. Note: Nutritional analysis is per serving; sodium data not available.